Ripping a sheet outta the playbooks of CP+B, Pourquoi tu cours, Rocketboom (which sold inventory, not creative power), and possibly this guy, 24DP is is using eBay to auction off its award-winning director services. Bids have exceeded $2225.00, which makes this a success in our book, and there are still 5 days and 4 hours left on the clock. Make the Logo Bigger also encourages labor-whoring skeptics to "view it from the POV that it's a one-time deal to get them on the radar of more agencies and anyone needing viral/spot/video help." And of course the shipping's free. Keep track of what happens -- without having to keep visiting eBay -- by following 24DP on Twitter. Don't Just Talk to Them; Bring Them Aboard. Based on the premise that people are more likely to watch a play if they know somebody in it, agency Happy Soldiers added a new scene to Spirithouse Theatre Company's play, "Vigil." Spirithouse is a fairly new indy theatre company in Australia. 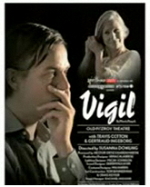 "Prelude to Vigil," the new scene, takes five minutes and requires a fresh and local casting call every week. Spirithouse says this was a first for an independent play group. Kind of a neat approach to (not?) advertising: personalizing an entire performance, and stimulating engagement, which in turn serves to generate word of mouth and record attendance. Apparently the play sold out in every instance. - Twitter to launch Verified Accounts. - Toyota's 3G Prius site. By EVB. - Dunkin' to sell Alabaman's sour cream/Heath bar doughnut. - More paid Twitter stream swill. - Wikipedia crosses into printdom. Few things entice us as readily as a Bejeweled knockoff. 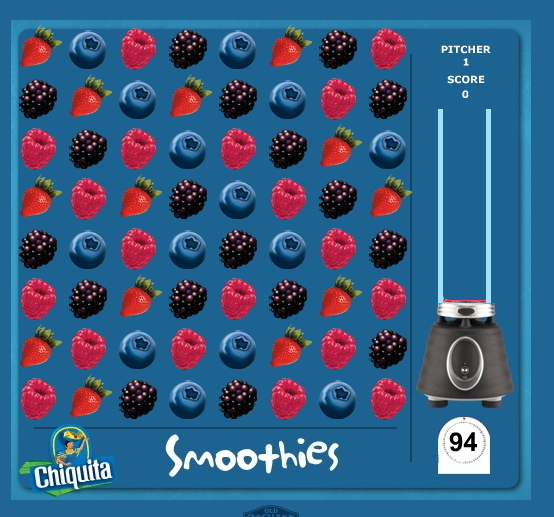 We've lost whole days to this game; now, on account of Chiquita, we've lost our whole afternoon. Work by matrixx, which knows the secret to a good advergame: keep it simple, incentivize gamers; tap into something they're already obsessed with and know how to play. UPDATE: What the hell kind of advergame doesn't have a pause button. Are you trying to get us fired? In time for allergy season -- which not only stimulates sneezes but generates impromptu tear-duct leakage -- Kleenex erected a Tissue Tree, swathed in silk, no less, beside Sydney's Museum of Contemporary Art. The tree was inspired by the work of "wrapping" artist Christo and is wrapped in over a kilometer of silk. (See metric conversion here.) More importantly, it sports 700 generous tissue blossoms, which passersby can tug out at leisure. Clever way to promote Kleenex Silk Touch, whose wares are supposed to be even softer than the average snot receptacle. Greenpeace is gonna have a helluva good time tearing the lovely idea a new one, though. We can already hear the siren song: Turning your gauche synthetic wares into fake spins on the noble arbors that fell for your cause? You sick bastards! 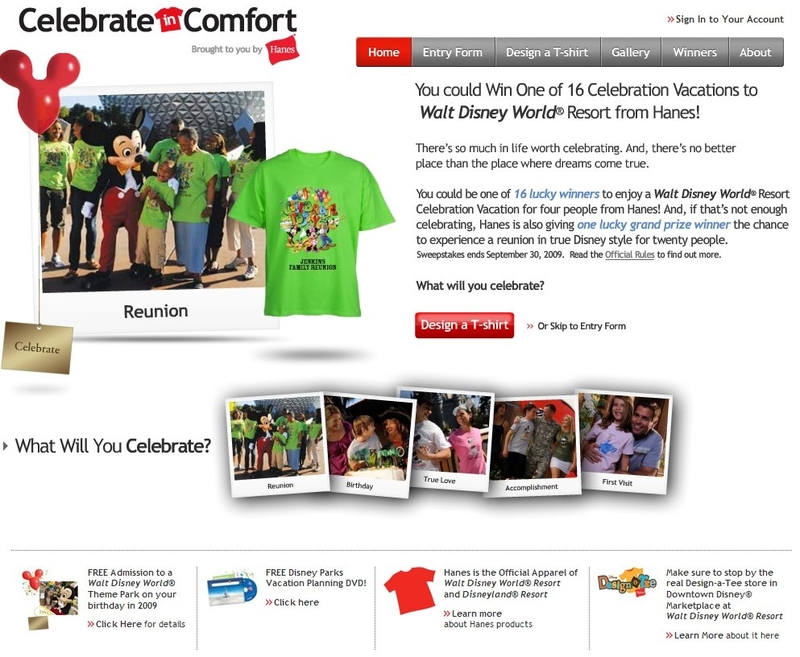 Hanes hooked up with Night Agency to launch Celebrate in Comfort, a promotion which offers up 16 people a Walt Disney Celebration Vacation for four people...if they enter and win a t-shirt design contest. You'd think with all the supposedly talented designers we have in advertising, all 16 winners would come from our industry. Well, that won't happen if you don't enter so head over to the site and get your creative freak on. 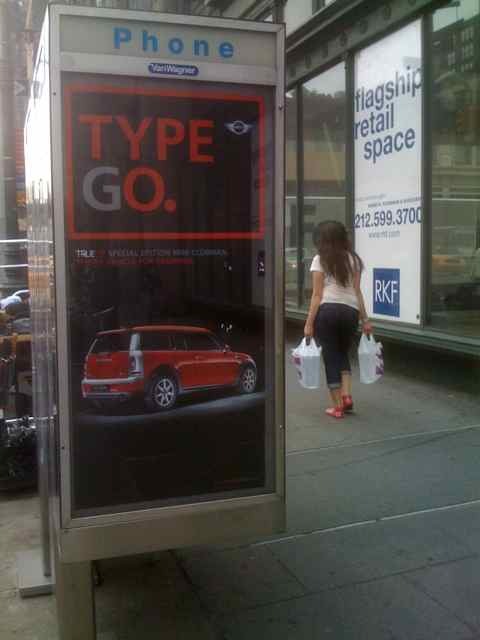 The Gift for the Copywriter Who Has Everything. Except a Hobby. This cool minimalist skateboard design, with "Hello" printed on it in nine or ten languages (if you're counting "Hallo"), is the fruit of a collabo between California skate label Buddy Carr and New York-based typography designer Antonio Carusone. Top of board is black with "Hello" in white; wheels are printed too. More photos at Fubiz. There are currently only 100 boards for sale at the not-bad rate of $160 apiece, so we strongly suggest dropping that cash like its hot. Hat-tip to @pakkoidea. Asa Bailey and Cream Recruitment tag-teamed to poach a bit of business -- and maybe some creatives, too -- from their new London neighbour: Saatchi & Saatchi. The pair pretended to "hack" the Saatchi site (its actual site is located at saatchi.co.uk: SaatchiandSaatchi.co.uk sports subversive scribbles and a video that lends unattractive insight on the big agency's goings-on: how it crushes the dreams of earnest creatives, etc. The video's end promotes Cream Recruitment, but the lower left-hand corner features also subtle pluggery for Asa Bailey Viral Advertising. Cold, man, cold. Though to be fair, any agency that thought this was socially acceptable behaviour was just begging to have their interns snatched.